Golden sweetcorn fritters, served in a stack with crispy bacon and dollops of guacamole, make a great family supper dish. Sift the flour with a pinch of salt into a large mixing bowl. Pour the milk into a jug then add the egg yolks, chilli flakes if using, and parsley. Mix well. Gradually add the egg mixture to the flour, whisking until smooth. In a clean bowl, whisk the egg whites until they form soft peaks, then fold into the batter along with the sweetcorn. Leave the batter to stand while you make the guacamole. Using a fork, mash the avocado with the lemon juice, mayonnaise and seasoning until smooth and creamy. Set aside while you grill the bacon on a medium heat for 3-4 minutes until crisp. Meanwhile, heat 1 teaspoon of oil in a frying pan. Ladle spoonfuls of the batter into the pan to make individual fritters about 10cm in diameter. Cook in batches of 3. Fry the fritters for 3-4 minutes on each side, until golden brown, then keep warm while you cook the remaining batches. 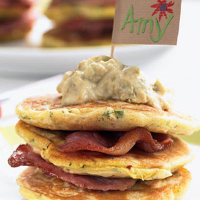 Cut the bacon rashers in half and sandwich between 3 fritters, to make a stack, then repeat. Serve topped with a generous dollop of guacamole. Any leftover fritters can be cooled, then frozen for enjoying another day. To save time, buy Waitrose Fresh Guacamole Dip instead of making your own.